Exactly to the in-vehicle tool with Compact! Ratchet Handlebar is very convenient with Compact. Although it can not be used in high Torque, it is very good for an in-vehicle tool for emergency. Because it can be stored as it is with Case, I think that Space should allow it. Even so Torque is necessary enough! Convenient!! 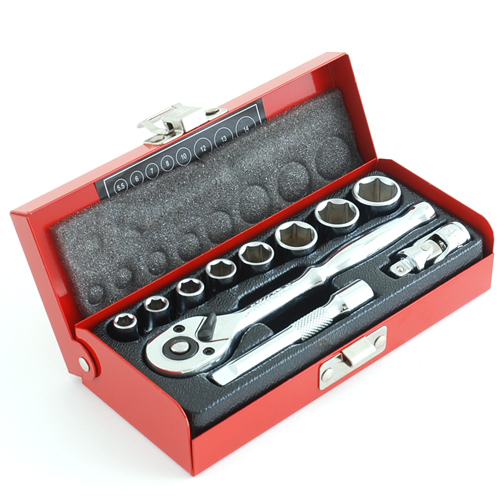 It is easy to use Ratchet set. Design of Case is also good, Size is also good. Ratchet can also switch (Naturally?) Compact and easy to use! Very fit with Standard tool. That's enough Used for Plug replacement immediately. There is no problem if the surrounding of the plug is Opening like Harley, but because there is no Hold function inside the Wrench, in a vehicle with a Plug in the Plug Hall, detachment of the Plug - It may not be easy to install. I think that it is enough. I purchased it because the second hand FTR 223 did not have an on-board tool. I still use it only for detaching Battery, but for the time being I think that necessary tools are provided. I am satisfied with Cost like. It is easy to use. Because I did not have a tool for Small Nut, I bought this product with Sale as a machine. 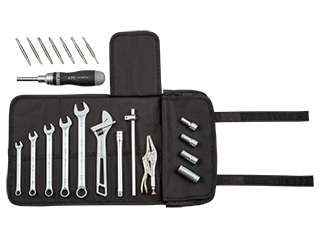 I have not had Rachet Type tools before and I am also looking forward to being a trusted JAPAN, but I am extremely easy to use and satisfied. Extension bar which can be extended for a place with depth and set to universal joint for bent place, these can also be used together. Case is kinda cheap feeling, but since the tool is the purpose, there is no problem at all. I am satisfied.. It was necessary for maintenance of Motorcycle using Torque and purchased. If you have Sunday mechanic, especially Owner such as BMW, I think that it is a useful and useful tool. Prepare to compensate for missing things yourself I bought it as an on-board tool so that it can cope with Trouble at the destination. I only pray that this tool is not included in this price ~ - - - When. It might be better to procure tools of the same Size from other Manufacturer to similar Tool Bag. It is a product that you do not need to buy except people who want to use firm tools even in emergencies with people who must be KTC. However, tools are fortunate fortune. If you buy a high one and use it for Large cut it will be safe until you die. Someday you will be able to help you somewhere. I wanted Swivel gear wrench and purchased it. It is very convenient to switch between lock and free. I think I will arrange other Size soon.